Because one flea can be a problem for the allergic dog, strict flea control is essential. 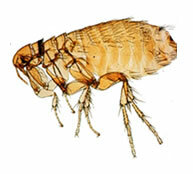 This is difficult considering the life-cycle of fleas, but with modern medications and home treatment options, you should be able to provide a flea-bite free environment for your dog (see Fleas for additional information). 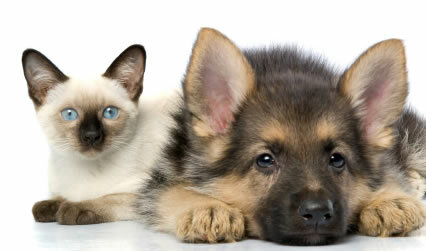 Your veterinarian can give you tips on protecting your dog from fleas. When strict flea control is not possible or in cases of severe itching, anti-histamines or corticosteroids (steroids) can be used, under careful veterinary guidance, to block the allergic reaction and give relief. If secondary bacterial infection is present, appropriate antibiotics will be prescribed. Although allergic rhinitis and bronchitis might be regarded as the result of inhaled allergens, the term ‘Inhalant Allergy’ in the dog is used as a synonym for Atopy. The main causative inhaled allergens are tree pollens (cedar, ash, oak, etc. ), grass pollens, weed pollens (ragweed, goldenrods, etc. ), molds, mildew, and house dust mites. Many of these allergies occur seasonally, such as ragweed, cedar, and grass pollens. However, others such as molds, mildew, and house dust mites are year-round. When humans inhale these allergens, the allergy manifests mainly with respiratory signs – runny eyes, runny nose, and sneezing (‘hay fever’). But in dogs the result is itchy skin (pruritis). 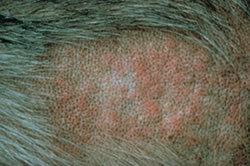 Due to these clinical signs, the condition is also called ‘Inhalant Allergic Dermatitis’. The dog may rub its face, lick its feet and scratch the axillae (underarms).